How was your weekend, autumn equinox, Mabon, first days of Libra, etc.? I hope it was awesome. I went on a (rather nice) date and…well, not much else. I was somewhat productive, but have been enjoying a break from a lot of things. Still, not much compares to being busy and being productive like nobody’s business. One thing I did get around to was woodburning a sign for my dad and stepmom. They got a new camper recently and, knowing that I’m into woodburning, asked me to create a sign for them to spruce up the thing. They were both in the Navy, so it’s got a skull and crossbones and their names written in a pirate-y font. Not a bad job, I’d think, but I’m a little biased. I’ll probably add a layer of finish to it soon and give it to them the next time I see them, likely around Thanksgiving. Of course, being a magician and all, I couldn’t help but to burn a little sigil onto the back of it. I don’t do sigils much, but they’re definitely a useful tool to have in one’s toolbox. Below is a rendition of the sigil I put on, which turned out absolutely lovely in Illustrator (the Live Trace tool is the BEST THING EVER). This’ll give the plaque a little oomph as they take their camper around the country with them, I hope. 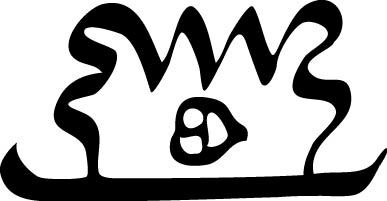 Since I’m big on intoning things, what with my Buddhist mantrayana background and coupled with Hermetic words of power, the vocalization and intonation of the sigil is “SAVU RITFA BED” (sah-voo reet-fah behd). When I make sigils, I use a kind of cursive I developed for private use. It’s a script I developed back in junior or senior year of high school and have been using ever since for all kinds of notes. Since creating it originally to compensate for my normally awful penmanship, I’ve made a few modifications and extra letters along the way. I consider it a shorthand, since it’s got distinct symbols for common digraphs and duplicate letters in English, but it’s mostly a simplified form of the Roman alphabet without case and with fewer strokes. The simpler, more fluid letterforms lend themselves well to joining and flowing into each other, a good thing for making sigils. I love that it looks effective, but not overly “magic-y”. I don’t know if your parents know of or support your practices, but I could totally see this flying under the radar if they didn’t. My family’s a collection of freaks and geeks: a Raelist workaholic mother who crochets whole blankets in a day’s time, a network administrator and Linux geek father, an OCD somewhat neurotic stepmother, a professional astrologer/Human Design counselor/tarot reader and punky chaos magician sister, and an orthodox Jew brother who wants fourteen kids. Somehow, I’m one of the more conventional ones in the family.